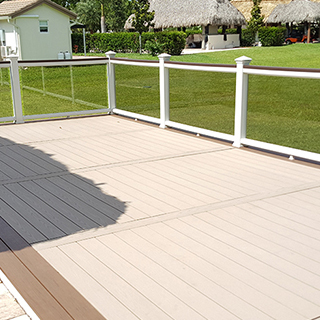 What are the design and construction options for wooden decks in South East Florida? Scanner Roofing & General Contractor Inc. integrates color, style and architectural preference to blend naturally with the existing landscape while considering functional as well as aesthetic requirements. Do you want to create an elaborate outdoor haven? Or a simple extension for your home? Scanner Roofing & General Contractor Inc. designers and builders construct wooden decks to enhance any home or business. Choose from a wide range of finishes and select from a palette of natural colors and stains. Scanner Roofing & General Contractor Inc. professionals also provide easy-to-follow maintenance tips to ensure your deck lasts for many years. Scanner Roofing & General Contractor Inc.'s hassle-free service includes taking care of the paperwork according to South East Florida building code regulations. Fully insured and licensed builders provide free estimates and design consultation for outdoor living at its best!